A beautiful surviving example of a vintage Hadrill Horstmann magnifying lamp. 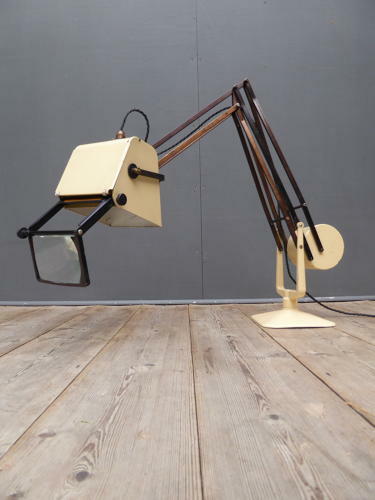 An unmistakable industrial design classic featuring the iconic cast iron counterbalance mechanism, original cream paintwork and articulated magnifying lens which folds into the upper part of the shade when not in use. Wonderfully over-engineered, the lamp was the flagship model of the Horstmann range & boasts a total of nine separate 'arms' which work in harmony with the heavy cast iron counterweight to provide an extremely well balanced lamp with a good reach in all directions. A simply stunning lamp.